The Breckwell P24 has been around for a long time under various names, since 1988 in fact. Ron Crasilneck of Breckwell stoves himself says that this traditional rustic looking pellet stove "is not for a designer home". Even so, it gets the heat out reliably. He describes it as "their workhorse". 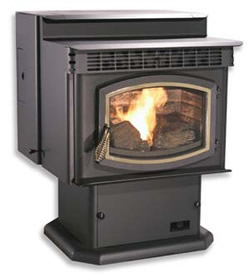 A whole house heater giving 50,000 btu., the P24 has a hopper capacity in the freestanding model of 65 lbs., the Insert holding 5 lbs. more. This allows a burn time of 65 and 70 hours respectively. 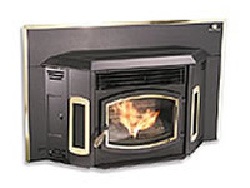 The P24 Looks at first glance like a bay window type stove, but it isn't. The side panels are dummies. It has a large ash pan for a stove of this size, and is recommended to be emptied only after burning a ton of fuel. See comments below. Hopper Capacity Freestanding 65 lbs. Insert 70 lbs. Burn time Freestanding 65 hrs. Insert 70 hrs. Weight Freestanding 325 lbs. Insert 260 lbs. Window Size 13 in. by 10 in. 28 in. by 44.5 in or 32 in. by 48.5 in. It's recommended that the Breckwell P24 not be run for more than one or two hours at a time on the high heat setting to prevent damage. If you would like to leave a review of the Breckwell P24 pellet stove or fireplace insert, please use the form on the contact page.